Estate planning is a common legal step that people often fail to take when they are divorcing. Most people think of estate planning as “getting a will done,” but it entails much more than that. Estate planning has a lot of fancy definitions, but what it really means is: taking care of yourself, your family, and your assets if you die or are incapacitated. Any plans that you made (or didn’t make) while you were married are likely to drastically change before, during, and after the course of your divorce. Here’s a look at the important issues you face at each stage. In Oregon, before you file for divorce, it’s a good idea to sit down with an estate planning attorney to see what steps you might take to protect yourself, your kids, and your assets. Once you file for divorce, there is not a lot that you can do to protect your assets. It may be that you are able to set up your own bank accounts or transfer title to certain assets before you file for divorce. This is not the type of thing that you want to do without the guidance of a family law attorney, because it could affect the outcome of your divorce property division. It’s important that you create documents that name a Healthcare Representative, (Financial) Power of Attorney, and Personal Representative/Trustee (person who makes legal and financial decisions for you if you die). If you don’t name someone else, the default is usually that as long as you’re still married, your soon-to-be-ex-spouse may have control over your healthcare and financial decisions. If you don’t trust your spouse to make these decisions, you’ll want to name a friend or family member that you can trust. You should set up a Revocable Living Trust (RLT) plan to hold your assets. If you don’t have any assets that would go through probate, then a Will-based plan may be fine. An RLT is an entity that helps you to avoid a conservatorship if you are incapacitated, and a probate if you die. Both of these are expensive court proceedings that most people who own any assets wish to avoid because of the cost, time delay, and privacy issues that arise. You will want to look into various accounts that you own and if they are beneficiary-designated, you’ll want to address the issue of taking your spouse off as a beneficiary and adding the beneficiaries that you do want. Depending on the type of account, you may not be able to do this without your spouse signing off on it. If you do all of these things before filing for divorce, you’ll be in pretty good shape, but will need to check in with your estate planning lawyer during and after the divorce. 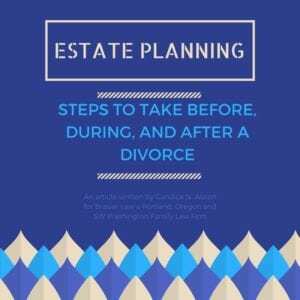 Perhaps you didn’t know that you had estate planning issues until after you filed for divorce. Now you are limited in what you can do, but there are still important steps that you can and should take. Once you have filed for divorce, you basically can’t do much in the way of moving assets, even if just for estate planning purposes. At this phase, you’d still want to make sure that you’ve created documents that legally name representatives to handle healthcare and financial decisions for you if you’re not able to do so yourself. You should also communicate with the people you have named in your plan so that they know they’ve been named and where to find your documents. During your divorce proceedings, you can set up a Revocable Living Trust, but you won’t be able to put any of your assets into the trust until after the divorce is completed. Instead, in addition to a Revocable Living Trust, you should also execute a simple Pour-over Will. A Pour-over Will tells the probate judge that you want your assets to be placed into your trust if you die, so if you die during your divorce proceedings, your representative can make sure that whatever you are awarded in the divorce decree is placed in your trust and protected for your beneficiaries. If you complete these steps during your divorce proceedings, you’ll have partially protected your estate if you die or are incapacitated, but you will need to meet with your estate planning lawyer after the divorce is finalized so that you can finalize your estate plan as well. Once your divorce is over, you’re really not limited in how you can plan your estate. 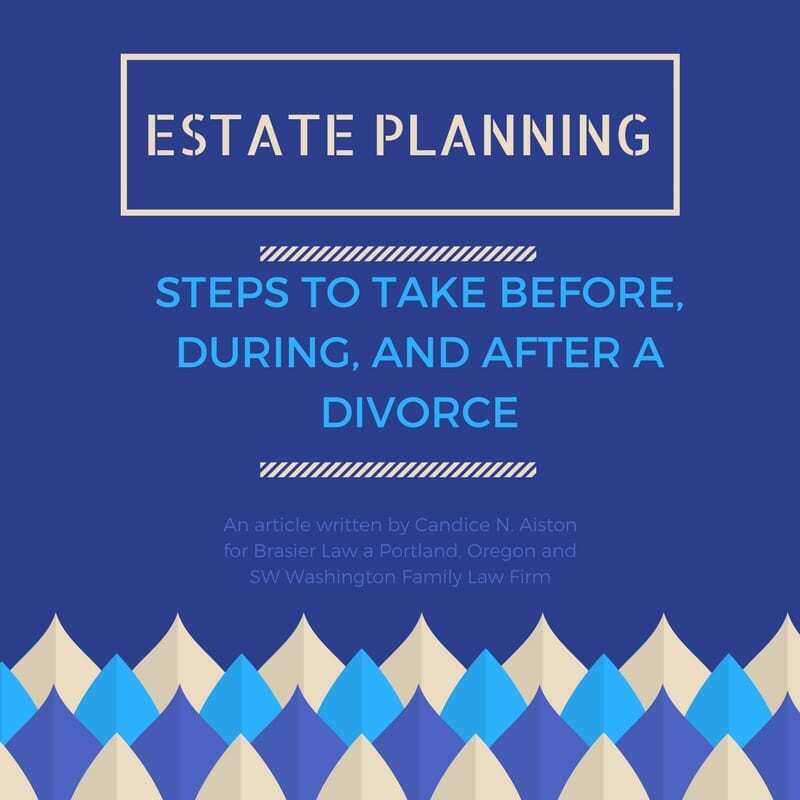 If you didn’t take any of the steps in contemplation of divorce, any estate planning you did previously is probably void. You will likely need to create an entirely new estate plan, protecting your assets for your beneficiaries. In most situations, the default if you don’t create your own estate plan is that, if you die, your estate will go to your kids. If they are minors, their guardian will have control over their assets. Effectively, this means that your ex-spouse may have control of any inheritance you leave behind for your kids. If that scenario doesn’t work for you, you need to meet with a lawyer and create a plan that does work for you. If either you or your spouse dies, the surviving parent becomes the sole custodian. It’s important to name guardians for your kids in the event you and your ex-spouse both die or are incapacitated. The best-case scenario is that you and your ex-spouse can agree on who to name as guardians so that if you both die, there isn’t a legal battle between the two families over who gets guardianship of the kids. The importance of revisiting your beneficiary designations on life insurance and retirement accounts cannot be overstated. Your designations control where these benefits go– your divorce decree, will, trust, or any other document have no effect on what your beneficiary designation says. If you got divorced 20 years ago and remarried and have a new family, but forgot to change your beneficiary designation to take your ex-spouse off of your retirement or life insurance – if you die, the company will cut a check to your ex-spouse, not your new family. Additionally, after divorce, if you remarry, you will want to revisit your estate plan before you do so. You may wish to prepare a prenuptial agreement so that your new spouse can’t inherit any or all of your estate, if you want any or all of it to go to your children. One of the most common estate planning mistakes that parents make is accidentally disinheriting their children from a first relationship when they remarry. There are legal steps you can take to prevent this, while still providing for your new spouse for his or her lifetime. These are the major issues that arise during the three stages of divorce. Divorce makes estate planning messy and essential. If you need help at any of these stages, our firm is happy to help. Candice N. Aiston is an Estate Planning Attorney for families in the Portland, Oregon area. She helps loving parents to prepare their families for a lifetime of security, prosperity, and guidance. If you would like to receive her free reports, please visit http://candiceaistonlaw.com/. Follow her Facebook page for daily planning tips: https://www.facebook.com/aistonlaw/. You can contact Brasier Law for Oregon and Washington divorce, custody, protective orders, and other family law needs by calling 1 (503) 855-4777 or by using the contact form below.